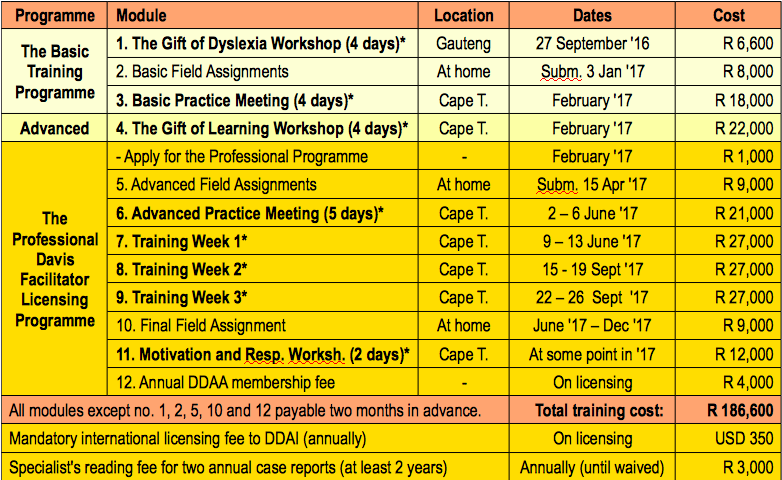 On September 27, 2016 Davis Dyslexia Association Africa will run a four-day Gift of Dyslexia workshop in Gauteng, South Africa. The cost per person is ZAR 6 600.- (with light lunch and break-time snacks included) and can be paid by EFT. Payment instructions will be emailed after registration is completed. Glow Worms pre-primary school, 218 Cornelis Street, Fairland, Johannesburg. Given sufficient interest, DDAA will offer the full training over the course of 2017 in South Africa, at the total cost of R186,600.